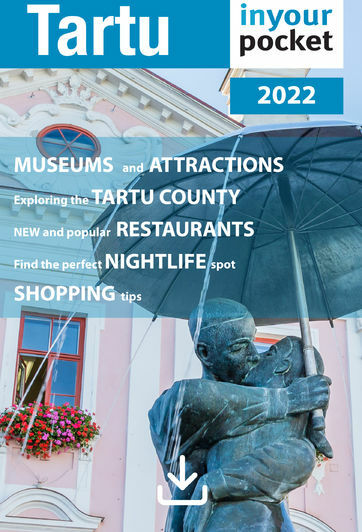 If you want to catch a glimpse of what much of Tartu looked like before the Second World War, we suggest taking a nice walk through one of the city’s historic districts. The most colourful and interesting of these is called Supilinn or Soup Town. The area, located in the northwest of town along the banks of the Emajõgi River was historically just a flood plain swamp. The district started to take shape in the 19th Century when the water level of the river subsided, leaving behind cheap but fertile land suitable for lowincome housing and vegetable gardening. Because of the numerous gardens in the area the residents gave the streets vegetable names such as Kartuli (Potato), Herne (Pea), Oa (Bean), Marja (Berry) and Meloni (Melon). This is where Supilinn got its amusing name. Having largely escaped the bombing and destruction of World War II, Supilinn is a showcase of pre-war wooden architecture, ranging in style from the simple to the elaborate. The rooftops are typically slanted, and the windows almost always crosssectioned. In the past there was never a concrete or coherent style set out for the buildings, although they still somehow seem to fit perfectly together. You can’t find any straight lines here, and the colour of the paint appears to have been chosen at random or according to the mood that day. At the same time the fading pastels are in harmony with the natural surroundings. As in the past, gardening still plays a big role in Soup Town, evident in the many wooden garden huts that litter the area. The whole picture is made perfect when you see the little backyard outhouses and woodpiles, and laundry hanging out to dry in the sun. Although a district is often defined by its layout and architecture, the residents of Supilinn have just as much to do with the area’s overall atmosphere. Over the years many intriguing characters have called Soup Town home. Traditionally, the neighbourhood’s inhabitants have been artists, vagabonds, musicians, rogues, drunks, prostitutes, students and the other less fortunate – after all the rent was cheap and there was enough space to grow your own food. Things are a little bit different and much safer today, but you will certainly still see many students, artists, musicians and the odd jolly drunk roaming about. The residents are a fun-loving and creative bunch and they throw some of the best backyard parties in town. There are countless stories and fascinating tales about the people of Supilinn, however the one we liked best includes a large group of intoxicated men who all decided to help their neighbour paint his house. As it turns out they all had a different (but expert) opinion on what colour it should be, and on the correct technique with which to paint it. We think that they probably all had a role in the final outcome. This is what community spirit is all about! The citizens of this district are proud of their unique home and as such they have even started their own association and their own aptly named newspaper The Supilinn Tirin (The Soup Town Tureen). They also celebrate their distinctiveness with the Supilinn Days, a spring festival that started in 2002 and includes all manner of creative, fun activities including dance, drama, music, literature, folklore and art exhibitions. The Supilinn Society also stages neighbourhood walks several times a year, providing great opportunities to get to know the area, its stories and rich history. The people of Soup Town also give an award each year to the district’s best-renovated house. During the ceremony a plaque is presented and attached to the building for all to see. During the early 1990s, the wild and crazy years following independence, there weren’t many rules or regulations that governed what should or could be built throughout the country. Needless to say there were all sorts of remarkable constructions and renovations taking place in Supilinn during that period. Now there are strict guidelines set by the city and the Supilinn Society to protect the historically important buildings and to ensure that the district retains its original flavour. Thanks to those, we can all be sure that Supilinn will survive for years to come. In fact Soup Town is rapidly being renovated, and because of its location and historical wooden architecture, is becoming a very attractive place to live. The prices in Supilinn are still very affordable compared to Tartu’s newer suburbs, but we doubt that will be the case in a few years. To take a tour of Supilinn we suggest walking down Emajõe street by the river up to Kartuli where you take a left and walk across Oa down to Herne. On Herne street keep left until you reach the Kroonuaia corner. Next, turn right and walking down Kroonuaia take a right onto Lepiku. This is a dead-end street but you can make your way through the yards after house number 12 to the parallel street on the left, Tähtvere. The city is now to your left, but to have a further look you can walk to the right just up to Marja street before finishing your Supilinn tour by walking down Tähtvere and Jakobi street back to the centre.